Where there’s money, there are thieves. While we know our users won’t fall for e-proposals from a Nigerian prince, crypto scams can be pretty savvy, which is why we are here to help you spot them from miles away. Below are the most common scams you’re likely to face when purchasing cryptocurrency, trading, or simply browsing blockchain forums and social media feeds for interesting news. This one is tricky, as Twitter and Facebook is increasingly plagued with imitation accounts that look almost exactly the same as the brands you’ve come to know and trust. Whenever you see a post offering tokens (ETH, BTC, or even CHP) make sure you always check the poster’s username. 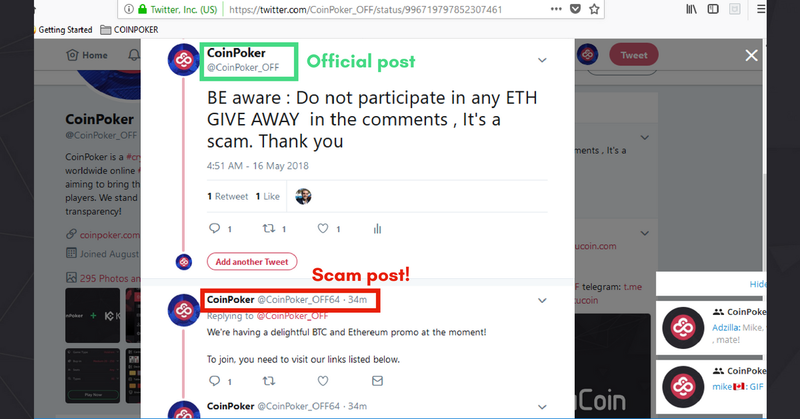 One example of a recent post that was reported to our team was by an account called “@CoinPoker_OFF64” which is close enough to our official account name (@CoinPoker_OFF) to trick you if you’re not careful. Example of a scammer trying to imitate our official Twitter account. If you spot fake or suspicious posts, whether its related to CoinPoker or not, always report it as spam. This will help others avoid losing funds and make the web a nicer place for crypto users like yourself. Much like imitation promos with sneakily close user profiles on social media accounts, a huge scandal that cost thousands of users millions in funds was pulled off by imitating an entire e-wallet homepage. The notorious MyEtherWallet scamwas pulled off by hackers redirecting users to phishing URLs with the same web layout and design. The scammers tricked users into revealing their private and public keys, giving them the ability to empty the account in seconds. How to spot phishing site: check the URL! ALWAYS check the URLbefore entering your private keys or sensitive data no matter how secure or familiar the page may look. 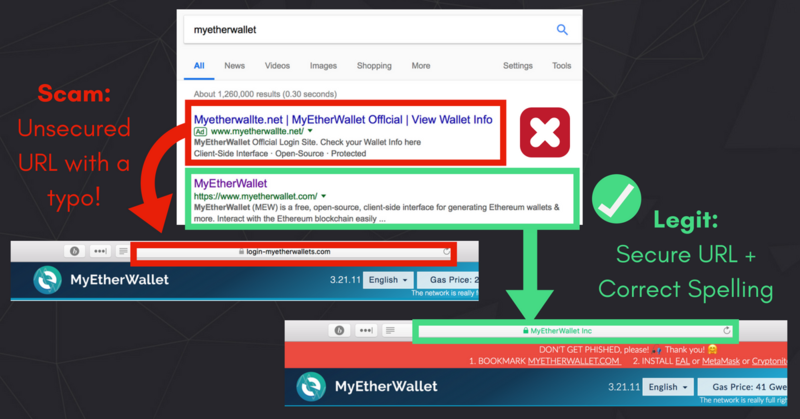 Above is a specific example for what to do on MyEtherWallet, but this applies to any browser based e-wallet client. This one may amuse long-time blockchain advocates, but it nevertheless another cruel way scammers have abused newbie crypto users. The term “paper wallet” refers to the use of a literal piece of paper to record your private keys and public address. The paper itself is useless, the information however is crucial to accessing your funds and being able to keep it safe from hackers (as in away from your computer). That is until people starting “selling” paper wallets on eBay. The scam is simple but was suprisingly effective. Perpetrators sold account addresses for actual money on eBay, and the confused buyer transferred funds into the seller’s account with no way of getting them back. Decentralization means lower fees, less bureaucracy, and more power in your hands. However, this also means you have more responsibility when it comes to keeping your money safe and secure. 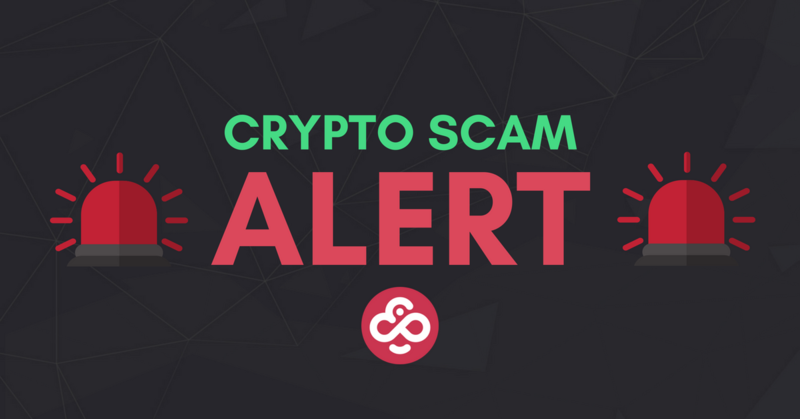 Keep an eye out for these scams, and always report and consult with active communities on Telegram, Reddit, and other crypto forums when you spot issues.